"A plant- and marine-based mist formula to help visibly reduce pore size and sebum overactivity"
I do deal with an overactive T-zone like a lot of people do, I think it's one of the most common places. Working on a make-up counter too, I want my make-up to last as long as possible during the day, without my make-up slicking downwards. I was surprised by being sent this Hylamide Pore Flusher. 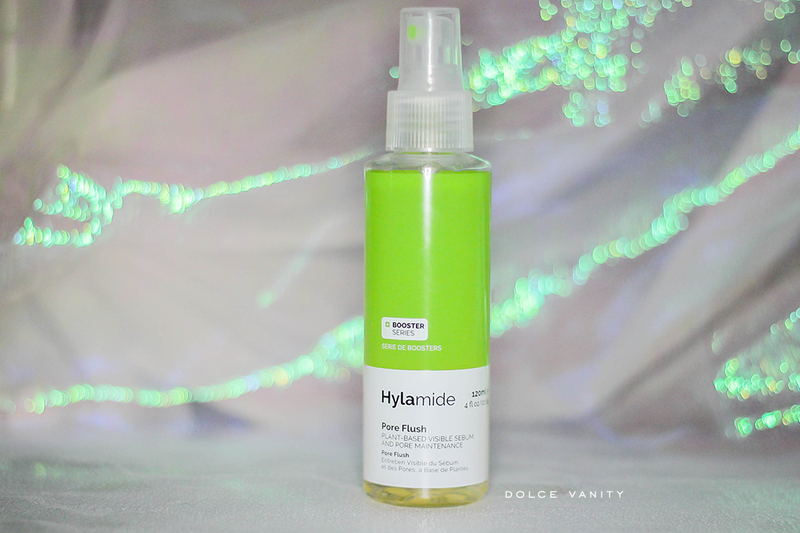 Hylamide is a brand under the awesome Deciem umbrella. Being that it's aimed at reducing pore size which I don't think I really have much of a problem with but sebum overactivity - yes. Besides Aqua being the first ingredient within this, witch hazel is second on the list, I normally go between The Ordinary Glycolic Acid Toning Solution and my witch hazel because I do find witch hazel for daily use to be too much for my skin. Pseudoalteromonas ferment extract can be looked upon as a humectant and helps the skin retain moisture by retaining water. Spiraea ulmaria extract also known as Meadowsweet commonly used to clears the skin & resolves rashes & Agathosma betulina is the pore refining ingredient here! It'll help shrink the pores if you have enlarged pores. It also lists Citric Acid & this can help exfoliate the skin. I guess, we can look at this to get clearer, brighter and more refined skin. I cleanse my face and allow it to dry before spraying this either onto a cotton pad or directly onto my face. The smell is quite 'green' and sweet - similarly reminds me of fresh cut grass. It's to be used morning and night, I think this way the skin will benefit more from the Pore Flush too. I can't use it daily as I do find it can dry the skin out too much even with my additional skincare routine as I do use a few AHA's within my routine so my skin is constantly exfoliating. Like I mentioned before how I apply it, if I find that my t-zone is needed to be more targeted I only use it in specific places. But it does seem to control my oil quite well, for £13 it's very reasonable especially as I don't have to use more 2x a day. Have you tried the Pore Flush? Wow that sounds like an interesting product and it’s isn't badly priced at all!